Implant dentures are an advanced restorative dentistry technique that can eliminate many of the common discomforts and inconveniences of traditional dentures. At Beautiful Smiles, we focus on supporting and enhancing the function of your teeth and gums as well as delivering cosmetically attractive, youthful results. By using a select number of dental implants to securely fasten your new dentures into place, our experienced dentist in New Jersey, Dr. Harold A. Pollack, can replace missing teeth with results that feel comfortable, stable, and natural. Implant dentures, also known as implant-supported or implant-anchored “fixed” dentures, are designed to improve upon standard dentures in a number of ways. Traditional dentures often involve the application of messy adhesives and can cause irritation or slippage along the gumline. Implant dentures utilize titanium posts implanted through the gum and fused to the jawbone (mimicking a natural tooth root) to stabilize the dentures. Since implant supported dentures rely on dental implants rather than adhesives, these common frustrations are significantly reduced or eliminated. What are the benefits of implant dentures? 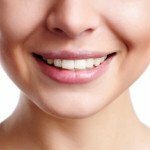 Am I a candidate for implant dentures? To determine your candidacy for implant supported dentures, Dr. Pollack and his dental team will perform a comprehensive oral exam, take a full set of x-rays, and carefully review your medical history. Dr. Pollack will then inform you of your tooth replacement options and give you his recommendation so that you can make an educated decision about the health of your teeth and gums. For patients who are not candidates for a full set of dental implants, implant supported dentures may be an alternative solution. Ideal candidates should be free of certain medical conditions and have generally healthy gums before treatment (if periodontal disease is identified, it can often be treated before the implant dentures procedure). Patients with an extremely low jawbone density may not be ideal candidates for implant supported dentures; if that is the case, Dr. Pollack can recommend effective alternative options. 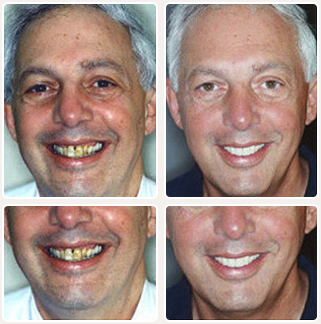 How is the implant denture procedure performed? Once your customized treatment plan has been created, the first step of the implant dentures procedure will be to place the implants themselves. Sophisticated x-ray technology will provide a detailed map as to the precise area where the implants will be placed, allowing for the most comfortable and effective fit for the denture appliance. It will take a few months for the implants to adequately fuse to the bone; during this time, a temporary denture can be placed for your convenience. In some cases, it may be possible to affix the final denture at this time. Dr. Pollack will determine the best course of action based on individual needs. When the fusion process is complete, the final customized denture will be affixed to the top of the implants. It usually only takes about two to four implants to secure the denture to the area; however, depending on each patient’s unique needs, more implants may be required. The implants themselves are designed to become a permanent part of your mouth. 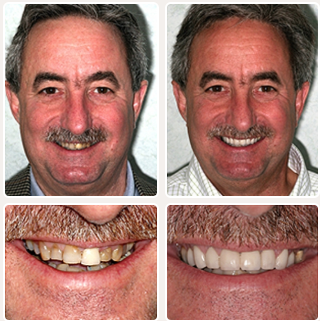 With the proper care of your implants and your denture appliance, the results have the potential to last for decades. What is the cost of implant dentures? The total cost of the implant-supported dentures procedure varies from patient to patient, depending on each individual’s unique needs. Factors such as the extent of the procedure, the number of implants required, whether full or partial dentures are necessary, any additional dental treatment that will need to be performed, and the skills and experience of the dentist are all taken into account. A member of our dental team will provide you with an estimate of the total cost before treatment begins and can go over your payment options with you. For patients who may want to finance the procedure, our practice works with CareCredit®, one of the most reputable dental financing companies in the nation. CareCredit® offers a number of low- and no-interest financing plans that can help qualified applicants pay for the procedure over time. If you would like to learn more about implant supported dentures, or to schedule an appointment to determine your candidacy, please contact us today.